84 Commercial Real Estate & Properties in Pyrmont are listed in 5 categories. We have 76 OfficesSale & Lease , 3 Other Commercial PropertiesSale & Lease , 3 Retail ShopsSale & Lease , 1 Development LandsSale & Lease and 1 Medical and Consulting PropertiesSale & Lease . On offer is a fresh open plan 129sqm office with Blackwattle Bay and district views. Positioned on level 4 of the highly sought after 55 Miller Street commercial office building. 55 Miller Street features 3 lifts, secure basement car parking, high speed fibre connection to the building, on site building manager and onsite cafe and restaurant. Suite 4.06 features: 129sqm open plan modern office with excellent natural light Boardroom 1 car space included in rental (OSR parking space levy additional cost) Wonderful outlook to Blackwattle Bay Private amenities with shower and kitchenette with dishwasher and bar fridge Reverse cycle A/C Located beside Fish Markets light rail station and bus stop Great choice of eateries and shops at the door Contact Fringe Commercial to arrange an inspection. Want a Free Fitout and Furniture? This office is for you. Also don't pay rent until the 1st June (conditions apply). This modern 286sqm (approx) office featuring meeting/boardroom, partitioned offices, workstations and awesome staff break out kitchen area. Multiple hung TV screens, boardroom table and chairs, office chairs (and other items) also included. Centrally located in Pyrmont within close proximity to cafes, light rail and bus stops, fish markets and much more. The property offers the unique combination of high quality, modern office space within close proximity to a range of entertainment and dining options. Can include 2 car spaces at additional cost (potential for more parking upon request). Must inspect, call Karen or Stuart. Natural Light | Central Location | Bike Racks & Showers $580pw | 5 Person Workspa..
PROPERTY OVERVIEW $580pw Price incl. This super stylish modern managed space in Pyrmont offers private offices, coworking desks and meeting rooms. Close to Sydney's CBD, with views towards the ANZAC Bridge. We love the themed meeting nooks, phone booths and breakout zones and there's a great built in event space: this workspace is an excellent choice for individuals, small teams and large teams alike. Pyrmont is enjoying a period of gentrification with an explosion of fine dining, great shopping and leisure facilities landing in the area. The workspace benefits from close proximity to Sydney CBD and lifestyle and leisure options in Pyrmont and the city. The building has both in building and street parking and concierge on the ground floor, as well as speedy internet, AC, showers and disabled facilities. The advertised office space is perfect for a team of 5. If you need more or less space, we have over 30,000 furnished workspaces all over the world suitable for a team of 1 to 200+. Our award winning team offer a free service that will help you find the perfect solution for your needs, so reach out if you need more help. What you get for your weekly rent , 24/7 Access , Access to internal breakout areas , Commercial grade internet , Electricity usage included , Flexible terms , Premium Coffee/Tea Facilities , Fully equipped boardrooms, meeting rooms and day offices (fees may apply) , Plug and play furnished workspace , One simple bill for everything related to your workspace , FREE business networking events , Collaborative space with a great community feel Building features , Air conditioning , Bike racks , Dedicated men and ladies bathrooms , Disabled facilities , Modern fit out , Natural light , Showers , Modern communal food preparation areas , Car parking in building (Paid) , Car parking Street (Free) , Company Branding at reception , Concierge on ground floor , Pet friendly office space , Creative co working space 240m from Fish Market light rail station On site parking available Direct access from the Western Distributor 600m from Sydney's luxe casino resort The Star 130m to bus stop at Harris Street WHO IS OFFICE HUB? Office Hub has largest collection of shared office space, sublet office space, creative coworking office space and serviced offices, perfect for 1 200 employees. Let us take you on a tour of all the spaces that fit your needs and budget. Our service is complimentary and we work for you and the landlord to negotiate the most competitive deal in the market. Let us show you how shared and serviced offices can be the perfect solution for your business. All pricing shown excludes any local taxes such as GST or VAT Conditions apply A portion of the square meterage factors in access to shared space. The advertised price includes any incentives offered based on a 12 month agreement. If a shorter period is agreed to please note the price may increase accordingly. This promotional offer for new tenants only and may be withdrawn at any time due to space availability. $270pw | 2 Person Workspa..
PROPERTY OVERVIEW $270pw Price incl. This super stylish modern managed space in Pyrmont offers private offices, coworking desks and meeting rooms. Close to Sydney's CBD, with views towards the ANZAC Bridge. We love the themed meeting nooks, phone booths and breakout zones and there's a great built in event space: this workspace is an excellent choice for individuals, small teams and large teams alike. Pyrmont is enjoying a period of gentrification with an explosion of fine dining, great shopping and leisure facilities landing in the area. The workspace benefits from close proximity to Sydney CBD and lifestyle and leisure options in Pyrmont and the city. The building has both in building and street parking and concierge on the ground floor, as well as speedy internet, AC, showers and disabled facilities. The advertised office space is perfect for a team of 2. If that\'s not quite right, we have ready to use workspaces of all sizes all over the world and our free service will help you find the perfect solution for your needs. What you get for your weekly rent , 24/7 Access , Access to internal breakout areas , Commercial grade internet , Electricity usage included , Flexible terms , Premium Coffee/Tea Facilities , Fully equipped boardrooms, meeting rooms and day offices (fees may apply) , Plug and play furnished workspace , One simple bill for everything related to your workspace , FREE business networking events , Collaborative space with a great community feel Building features , Air conditioning , Bike racks , Dedicated men and ladies bathrooms , Disabled facilities , Modern fit out , Natural light , Showers , Modern communal food preparation areas , Car parking in building (Paid) , Car parking Street (Free) , Company Branding at reception , Concierge on ground floor , Pet friendly office space , Creative co working space 240m from Fish Market light rail station On site parking available Direct access from the Western Distributor 600m from Sydney's luxe casino resort The Star 130m to bus stop at Harris Street WHO IS OFFICE HUB? Office Hub has largest collection of shared office space, sublet office space, creative coworking office space and serviced offices, perfect for 1 200 employees. Let us take you on a tour of all the spaces that fit your needs and budget. Our service is complimentary and we work for you and the landlord to negotiate the most competitive deal in the market. Let us show you how shared and serviced offices can be the perfect solution for your business. www.office hub.com.au www.office hub.co.nz Conditions apply A portion of the square meterage factors in access to shared space. The advertised price includes any incentives offered based on a 12 month agreement. If a shorter period is agreed to please note the price may increase accordingly. This promotional offer for new tenants only and may be withdrawn at any time due to space availability. Enjoyable Working Environment | Sleek Interior | Buzzy Workspace $572pw | 4 Person Workspa..
PROPERTY OVERVIEW $572pw Price incl. Extensive renovations have transformed this former wool storage facility into a beautiful coworking haven! Attention to detail is evident in every aspect with stunning fit outs, original artwork and retained features such as original rough timber beams. Attracting both newly founded startups and established companies, this coworking office harbours a wonderful community feel with comfortable spaces igniting the inspiration of professionals from every industry. Offices and desks available now for short or long term lease! Where old world charm meets cutting edge development, Pyrmont is the Sydney suburb in the heart of the action close to hip Barangaroo and busy Darling Harbour. Afterwork dinner and drinks have never been easier in this incomparable Sydney location with everything within walking distance, including central shopping precincts, first class dining options and transport links of main ferry lines, trains, light rail and buses. The advertised office space is perfect for a team of 4. If you need more or less space, we have over 30,000 furnished workspaces all over the world suitable for a team of 1 to 200+. Our award winning team offer a free service that will help you find the perfect solution for your needs, so reach out if you need more help. What you get for your weekly rent Furnished private offices with desks, chairs & lock up storage units Commercial grade internet Electricity usage included Access to shared kitchen facilities Regular cleaning Fair use of a meeting room and boardroom Prestigious business address to put on your cards Flexible terms from 1 month long term 24 x 7 access to your office 24 x 7 security Office & building features Spacious, unique common areas Air conditioning On site staff Private phone booths Printing facilities Micro Roasted Coffee Weekly events 100m to The Star Light Rail 100m to Harris St Bus Stop 300m to the Western Distributor Plenty of popular bars, cafes & restaurants nearby WHO IS OFFICE HUB? Office Hub is Australia & New Zealands No 1 small office space commercial real estate agency. We have the largest collection of shared spaces, coworking and serviced offices in Australia & New Zealand, perfect for 1 200 employees. Let us take you on a tour of all the spaces that fit your needs and budget. Our service is complimentary and we work for you and the landlord to negotiate the most competitive deal in the market. Let us show you how shared and serviced offices can be the perfect solution for your business. www.office hub.com.au www.office hub.co.nz Conditions apply A portion of the square meterage factors in access to shared space. The advertised price includes any incentives offered based on a 12 month agreement. If a shorter period is agreed to please note the price may increase accordingly. This is for new tenants only. Features include: Suitable for office or retail or F & B use Provides creative space over a ground and mezzanine, connected via internal staircase Signage opportunities on busy Harris Street Transport hub (light rail, trains, buses, ferries) Abundance of car spaces at additional costs End of trip facilities For any more information or if you would like to inspect this property, feel free to give Deans Property a call today! Located directly across from Sydney Fish Markets and overlooking the water. Located approximately 2km west of the Sydney CBD and approximately 6km north of the airport. The property has excellent access to Sydney's orbital road network which includes the City West Link, Anzac Bridge and M5. The premises have access direct via stairs from Bridge Road. Open plan space with exposed timber beams and high Saw Tooth roof with skylights allowing good natural light. Main Features include: Timber Floors throughout 2 parking spaces available at additional cost Showers and Male / Female Amenities Air conditioning Existing fit out could be used as boardroom, executive rooms, training rooms etc. Suits a creative office user or Pilates/Yoga Studio (existing use) Signage from the Light Rail Available from 1 October 2018 For any further questions or if you wish to arrange an inspection please feel free to contact Deans Property today! 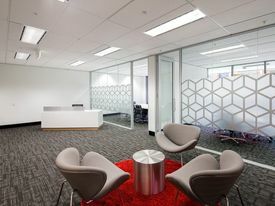 Collaborative Space | Creative Space | Natural Light $230pw | 1 Person Workspa..
PROPERTY OVERVIEW $230pw Price incl. Stunning shared office space in Pyrmont with incredible water views! The premium fit out of this warehouse conversion gives a modern, stylish and creative feel as you enjoy plenty of natural light and look out across the shimmering harbour at Jones Bay. With kitchen, access to scan/print facilities, and secure high speed internet included, this premium office space is ready for you to move into now. Businesses of all industries are welcome to share, connect and collaborate in this great space, particularly if you might enjoy a casual drink on the sunny deck on a Friday afternoon. This classy heritage building enjoys a prime waterfront position on Jones Bay Wharf, one of Sydney’s famous finger wharves off the foreshore of Pyrmont. Explore the Wharf to discover local companies, lovely cafes and classy restaurants at this uniquely sophisticated business address. The building itself is a three level heritage listed warehouse conversion with two bathrooms on the ground level and a bathroom and shower on the second level. Nearby parking is easy to find while Pyrmont, Darling Harbour, Wynyard and Town Hall are all within walking distance for amazing convenience. The advertised office space is perfect for a team of 1. If that\'s not quite right, we have ready to use workspaces of all sizes all over the world and our free service will help you find the perfect solution for your needs. What you get for your weekly rent , Access to internal breakout areas , Access to kitchen facilities , Access to secure printer and scanner , Building outgoings included , Collaborative space with a great community feel , Dedicated desk with business hours access , Electricity usage included , Flexible lease with the ability to grow into bigger space , Plug and play furnished workspace , Secure high speed Internet Building features , Abundance of natural light , Air conditioning , Car parking Street / Public Car Park (Paid) , Company branding in foyer , Creative space , Disabled access and facilities , End of trip facilities e.g showers, bike racks , Heritage listed building , Impressive reception with harbour views , Onsite Cafe / Restaurant , Pet friendly office space Short walk to light rail stations, and ferry wharfs. There is a bus stop at the front on Pirrama Road for B 389 line. Short stroll to The Star, Darling Harbour, and Pirrama Park. Numerous cafe and restaurant options on the wharf, including the famous Flying Fish restaurant. WHO IS OFFICE HUB? Office Hub has largest collection of shared office space, sublet office space, creative coworking office space and serviced offices, perfect for 1 200 employees. Let us take you on a tour of all the spaces that fit your needs and budget. Our service is complimentary and we work for you and the landlord to negotiate the most competitive deal in the market. Let us show you how shared and serviced offices can be the perfect solution for your business. www.office hub.com.au www.office hub.co.nz Conditions apply A portion of the square meterage factors in access to shared space. The advertised price includes any incentives offered based on a 12 month agreement. If a shorter period is agreed to please note the price may increase accordingly. This promotional offer for new tenants only and may be withdrawn at any time due to space availability. Fitted And Furnished | Cutting Edge Office Space | Free Meeting Rooms $5351pw | 31 Person Works..
PROPERTY OVERVIEW $5351pw Price incl. Extensive renovations have transformed this former wool storage facility into a beautiful coworking haven! Attention to detail is evident in every aspect with stunning fit outs, original artwork and retained features such as original rough timber beams. Attracting both newly founded startups and established companies, this coworking office harbours a wonderful community feel with comfortable spaces igniting the inspiration of professionals from every industry. Offices and desks available now for short or long term lease! Where old world charm meets cutting edge development, Pyrmont is the Sydney suburb in the heart of the action close to hip Barangaroo and busy Darling Harbour. Afterwork dinner and drinks have never been easier in this incomparable Sydney location with everything within walking distance, including central shopping precincts, first class dining options and transport links of main ferry lines, trains, light rail and buses. The advertised work space is perfect for a team of 31. If you need more or less space we have furnished and unfurnished offices ready to go from 10sqm 200sqm all over Australia and New Zealand. What you get for your weekly rent Furnished private offices with desks, chairs & lock up storage units Commercial grade internet Electricity usage included Access to shared kitchen facilities Regular cleaning Fair use of a meeting room and boardroom Prestigious business address to put on your cards Flexible terms from 1 month long term 24 x 7 access to your office 24 x 7 security Office & building features Spacious, unique common areas Air conditioning On site staff Private phone booths Printing facilities Micro Roasted Coffee Weekly events 100m to The Star Light Rail 100m to Harris St Bus Stop 300m to the Western Distributor Plenty of popular bars, cafes & restaurants nearby WHO IS OFFICE HUB? Office Hub is Australia & New Zealands No 1 small office space commercial real estate agency. We have the largest collection of shared spaces, coworking and serviced offices in Australia & New Zealand, perfect for 1 200 employees. Let us take you on a tour of all the spaces that fit your needs and budget. Our service is complimentary and we work for you and the landlord to negotiate the most competitive deal in the market. Let us show you how shared and serviced offices can be the perfect solution for your business. www.office hub.com.au www.office hub.co.nz Conditions apply A portion of the square meterage factors in access to shared space. The advertised price includes any incentives offered based on a 12 month agreement. If a shorter period is agreed to please note the price may increase accordingly. This is for new tenants only. Abundance Of Natural Light | Great Location | Creative Space $270pw | 2 Person Workspa..
PROPERTY OVERVIEW $270pw Price incl. The advertised work space is perfect for a team of 2. If you need more or less space we have furnished and unfurnished offices ready to go from 10sqm 200sqm all over Australia and New Zealand. WHO IS OFFICE HUB? Office Hub has largest collection of shared office space, sublet office space, creative coworking office space and serviced offices, perfect for 1 200 employees. Let us take you on a tour of all the spaces that fit your needs and budget. Our service is complimentary and we work for you and the landlord to negotiate the most competitive deal in the market. Let us show you how shared and serviced offices can be the perfect solution for your business. www.office hub.com.au www.office hub.co.nz Conditions apply A portion of the square meterage factors in access to shared space. The advertised price includes any incentives offered based on a 12 month agreement. If a shorter period is agreed to please note the price may increase accordingly. This promotional offer for new tenants only and may be withdrawn at any time due to space availability. 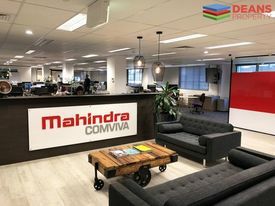 Located directly across from the Ibis Sydney Hotel next to Darling Harbour, this office suite offers one of the best locations for any business owner that is looking at being close to the CBD mix but not paying the huge rent. 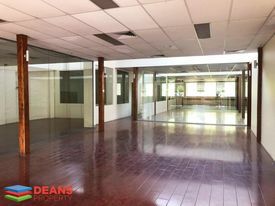 Short term offered, this Office Suite features: 2 Executive rooms Full Kitchenette with break out area 1 large boardroom Reception area Possibility for up to 30 workstations Lease term up to 31 August 2020 End of Trip facilities Call now if you are in between offices and need a space to occupy until then!! 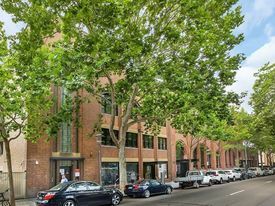 A Grade Building | Buzzy Workspace | Cafes And Shops Nearby $5739pw | 35 Person Works..
PROPERTY OVERVIEW $5739pw Price incl. Extensive renovations have transformed this former wool storage facility into a beautiful coworking haven! Attention to detail is evident in every aspect with stunning fit outs, original artwork and retained features such as original rough timber beams. Attracting both newly founded startups and established companies, this coworking office harbours a wonderful community feel with comfortable spaces igniting the inspiration of professionals from every industry. Offices and desks available now for short or long term lease! Where old world charm meets cutting edge development, Pyrmont is the Sydney suburb in the heart of the action close to hip Barangaroo and busy Darling Harbour. Afterwork dinner and drinks have never been easier in this incomparable Sydney location with everything within walking distance, including central shopping precincts, first class dining options and transport links of main ferry lines, trains, light rail and buses. The advertised office space is perfect for a team of 35. If you need more or less space, we have over 30,000 furnished workspaces all over the world suitable for a team of 1 to 200+. Our award winning team offer a free service that will help you find the perfect solution for your needs, so reach out if you need more help. What you get for your weekly rent Furnished private offices with desks, chairs & lock up storage units Commercial grade internet Electricity usage included Access to shared kitchen facilities Regular cleaning Fair use of a meeting room and boardroom Prestigious business address to put on your cards Flexible terms from 1 month long term 24 x 7 access to your office 24 x 7 security Office & building features Spacious, unique common areas Air conditioning On site staff Private phone booths Printing facilities Micro Roasted Coffee Weekly events 100m to The Star Light Rail 100m to Harris St Bus Stop 300m to the Western Distributor Plenty of popular bars, cafes & restaurants nearby WHO IS OFFICE HUB? Office Hub is Australia & New Zealands No 1 small office space commercial real estate agency. We have the largest collection of shared spaces, coworking and serviced offices in Australia & New Zealand, perfect for 1 200 employees. Let us take you on a tour of all the spaces that fit your needs and budget. Our service is complimentary and we work for you and the landlord to negotiate the most competitive deal in the market. Let us show you how shared and serviced offices can be the perfect solution for your business. www.office hub.com.au www.office hub.co.nz Conditions apply A portion of the square meterage factors in access to shared space. The advertised price includes any incentives offered based on a 12 month agreement. If a shorter period is agreed to please note the price may increase accordingly. This is for new tenants only. Cafes And Shops Nearby | Natural Light | Prime Location $450pw | 2 Person Workspa..
PROPERTY OVERVIEW $450pw Price incl. Stunning shared office space in Pyrmont with incredible water views! The premium fit out of this warehouse conversion gives a modern, stylish and creative feel as you enjoy plenty of natural light and look out across the shimmering harbour at Jones Bay. With kitchen, access to scan/print facilities, and secure high speed internet included, this premium office space is ready for you to move into now. Businesses of all industries are welcome to share, connect and collaborate in this great space, particularly if you might enjoy a casual drink on the sunny deck on a Friday afternoon. This classy heritage building enjoys a prime waterfront position on Jones Bay Wharf, one of Sydney’s famous finger wharves off the foreshore of Pyrmont. Explore the Wharf to discover local companies, lovely cafes and classy restaurants at this uniquely sophisticated business address. The building itself is a three level heritage listed warehouse conversion with two bathrooms on the ground level and a bathroom and shower on the second level. Nearby parking is easy to find while Pyrmont, Darling Harbour, Wynyard and Town Hall are all within walking distance for amazing convenience. The advertised work space is perfect for a team of 2. If you need more or less space we have furnished and unfurnished offices ready to go from 10sqm 200sqm all over Australia and New Zealand. Short walk to light rail stations, and ferry wharfs. There is a bus stop at the front on Pirrama Road for B 389 line. Short stroll to The Star, Darling Harbour, and Pirrama Park. Numerous cafe and restaurant options on the wharf, including the famous Flying Fish restaurant. WHO IS OFFICE HUB? Office Hub has largest collection of shared office space, sublet office space, creative coworking office space and serviced offices, perfect for 1 200 employees. Let us take you on a tour of all the spaces that fit your needs and budget. Our service is complimentary and we work for you and the landlord to negotiate the most competitive deal in the market. Let us show you how shared and serviced offices can be the perfect solution for your business. www.office hub.com.au www.office hub.co.nz Conditions apply A portion of the square meterage factors in access to shared space. The advertised price includes any incentives offered based on a 12 month agreement. If a shorter period is agreed to please note the price may increase accordingly. This promotional offer for new tenants only and may be withdrawn at any time due to space availability.